At no CRM.io, it's all about the next action and never missing out on a business opportunity. The lead is at the heart of the system, and whenever a new lead enters, the status is 'To-Do', meaning that you have to act on it straight away. 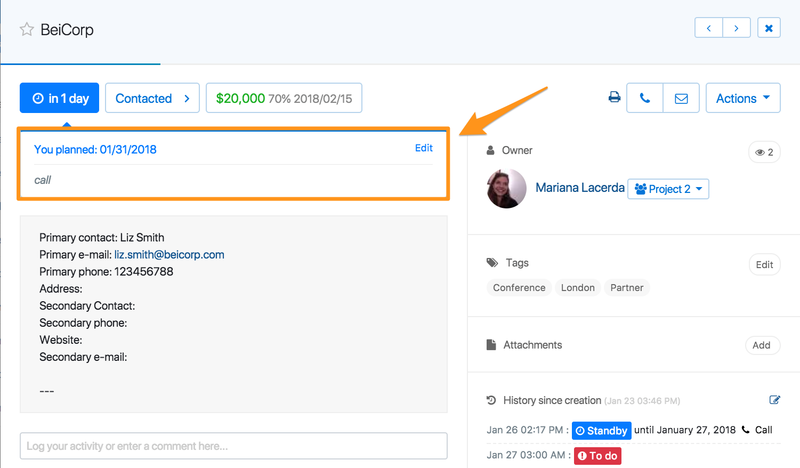 Once you're done managing a lead, you have to change the status to 'Standby', and set a reminder for the next action with that lead. 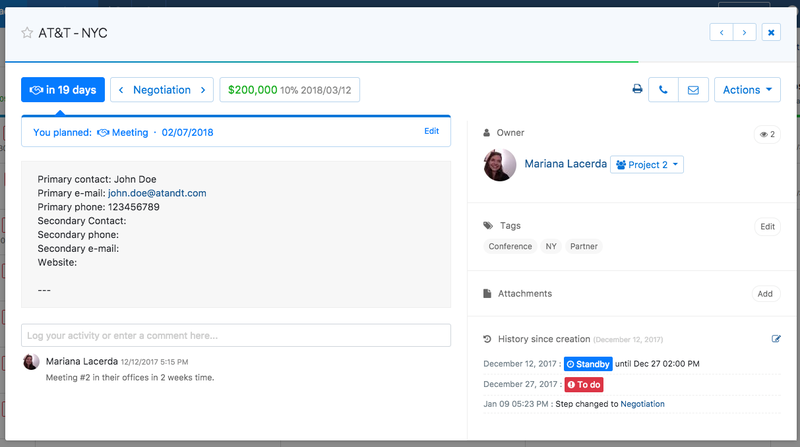 If you have the Expert Edition of no CRM.io, when setting a reminder for the next action, you can also define exactly what it is that you need to do next, i.e. choose a predefined Activity that you have set up in your account. How to create predefined activities in your account? As we have mentioned multiple times, no CRM.io adapts to the customer's needs and to the way they work. There are many parts of the sales process that you can customise to your needs, and predefined Activities is one of them. To create your own predefined activities, go to the Admin Panel > Activities, and start creating Activities. /!\ Each activity can be accompanied by outcomes. For example, if you set 'Call' as an Activity, you can define 'Answered' and 'Not Answered' as outcomes for that Activity. 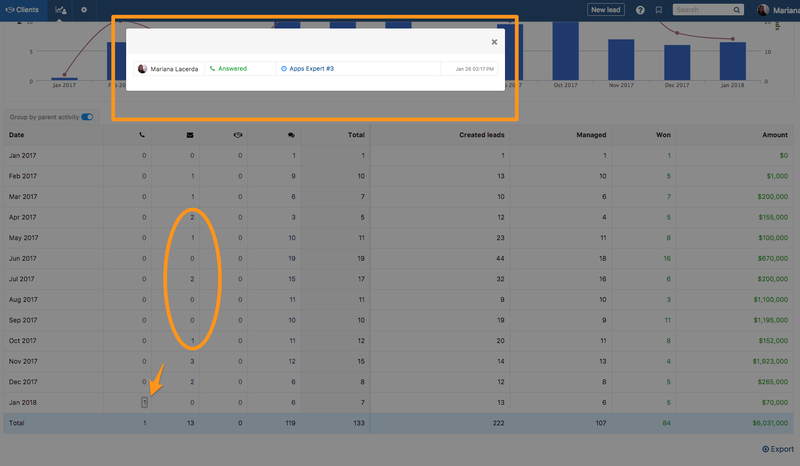 Once you've predefined the Activities in your Admin Panel you can start using the feature, which is at easy as changing the status of a lead to 'Standby' and selecting an Activity from the Dropdown menu 'Select an activity'. But that's not all! When the time comes and the lead goes back to your 'To-Do' page - and once you're done managing the lead - you can choose the outcome of the activity: was the call successful? Did you actually meet with them? etc. The Activities features of course comes with amazing Statistics, built to give you a deeper understanding of your lead management strategies. From the Statistics page of your account, click on the "Activities" tab and you'll then have the total amount of predefined Activities that were planned in your account for the period of time that you have chosen (see image below). But there's more. If you scroll down, in an Excel-like tab, you'll have even more detailed information. You can group the statistics by type (call, email, meeting), or have the detailed outcome for each "main" Activity. For Starter Edition customers, it's also possible to manually set the next action with your lead. When login the next action, you will see it at the top of the lead, and not in the comments section.